Arete Associates is an engineering consultant that has been in business for over 40 years. 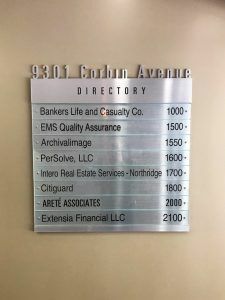 They have many locations throughout the United States, and their Southern California location is in a large office building in Northridge, California. Arete Associates is an existing customer of ours and we have worked with them over the past couple of years for many different types of interior and exterior signs. The most recent work we did for them was updating some interior signage. As Arete Associates shares the office building with other businesses, wayfinding and directional signs are much needed. In the past, we have replaced directory panels and suite ID signs for the interior. We simply replace the text on the directory glass to reflect the new tenant, and either create a new face for a suite ID sign for a new tenant, make a new backer panel, or both. For the exterior, we’ve done some work on their channel letter sign and monument sign. We refaced their existing channel letter sign. Front-lit channel letter signs often use colored vinyl or acrylic that can fade over time. The great thing about front-lit channel letter signs is that the acrylic faces are attached with a trim cap so they can be easily removed so the channel letter can be serviced, or if the face needs to be replaced. We took a pattern of the existing sign faces and made and installed new faces for their channel letter sign. For the existing monument sign, we also made new faces for both sides. There are many different types of office building signs that are required. Whether you need a new sign indoor or outdoor, or if you need us to update an existing sign, we’re on the job. Give us a call today to get started on your sign project!